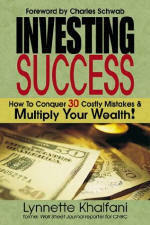 Costly Mistakes & Multiply Your Wealth! With a foreword from investing legend Charles Schwab, Investing Success is a practical, easy-to-understand guide that helps people take control of their financial lives and avoid or fix common money management and investing mistakes. Even for those who have never invested before, author Lynnette Khalfani-Cox – a former Wall Street Journal reporter for CNBC – provides clear and straight-forward advice about how to invest profitably in today’s market. Investing Success also describes how to get one’s financial house in order: by getting rid of credit card debt, boosting your savings, and taking care of the financial basics before you invest.